PRESS RELEASE No. 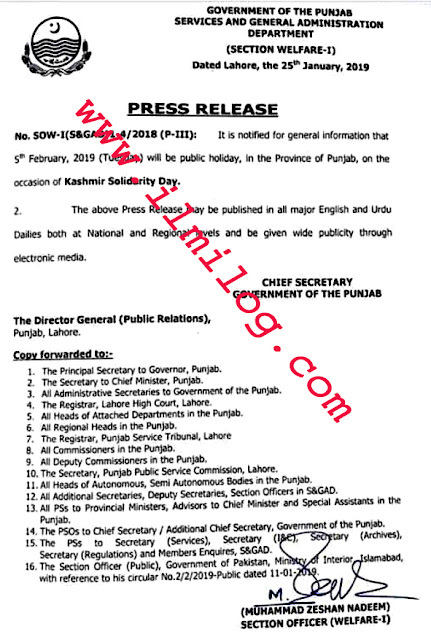 SOW-I(S&GAD) 1-4/ 2018 (P-III) dated Lahore, the 25th January 2019 regarding National Holidays 2019 as a Kashmir Day Punjab Pakistan by a government of the Punjab services and general administration department (section welfare-I). It is notified for general information that 5th February 2019 (Tuesday) will be public holiday In the Province of Punjab, on the occasion of Kashmir Solidarity Day. This Press Release above published in all major Urdu & English both Dailies at Regional and National levels. It may be given publicity wide through media (electronic & Print).